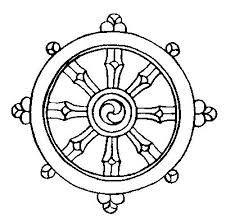 The historical Shakyamuni Buddha set forth a "study guide" to awakening. Each of the pieces of this Eight Fold Path are referenced and/or discussed throughout different sutra. This path is not to be regarded as a linear sequence, but rather a simultanious cultivation. The eight factors are methods of cultivating three qualities that are essential in the Buddhist path. These qualities are Wisdom (Prajñā), Morality or Ethical Conduct (Sila), and Meditation or Mental Discipline (Samadhi). The term "Right" could imply a "Wrong", and thus subject to the trap of dualistic thinking. Right, in this case, refers to a correct direction for cultivation. Wisdom, or Prajñā, is cultivated through the factors of Right Thought and Right Understanding. Right Thought is the act of mental selfless renunciation or a non-attached cognitive process. Thoughts of compassion, freedom from dukkha, and non-violent engagement are extended to all beings. Right Understanding is understanding the Four Noble Truths and that this explains the way the world is. This is not a surface understanding of things, but rather seeing deeply into the nature of truth that extends beyond conventional wisdom. Clear understanding without name and form. Morality, or Sila, is based upon a reverence and feelings of compassion for all living beings. For one who walks the path of the Buddhist, cultivation of compassion (karuna) is of high importance. Compassionate love, offerings of charity, and kindness to others. This is cultivated through Right Speech, Right Action, and Right Livelihood. Right Speech consists of truthful communication and avoidance of telling lies; the avoidance of slanderous talk of others and "talking behind someones back", and refrainng from any talk that induces hatred and disharmony within the Sangha or among people; not using harsh, malicious, and abusive language; and avoidance of engaging in any gossip or small talk. In contrast, one should engage in converstation in a manner that is not careless, and to do so in a manner that will assist others. When this is not possible, one should keep silent. This is akin to the old addage many may have hear from their parents, "if you don't have anything nice to say, don't say anything". Right Action is a call to engage in action that protects others and is a refrain from destroying life, from taking things not offered, from actions that use others for personal gain, and from sexual misconduct. Actions should be done in a manner that aims at benefiting the lives of all beings. Right Livelihood relates to the kind of work that one does to make a living. The Buddhist practicioner should refrain from doind work that brings harm to others. This may include things such as such as the selling or trading of weapons meant to take life, killing animals, cheating or swindling others, or infringes upon the wellbeing of others in any manner. Individuals are charged with the task of being in a job or profession that is honorable to the lives of others. Meditation or Samadhi, is cultivated throught the practice of Right Effort, Right Mindfulness and Right Concentration. Right Effort is the dedicated energy towards how we keep our minds moment to moment. The practicioner should work to leave unwholesome states of mind and to establish wholesome states of mind, and to develop work to continue cultivation of moral thoughts and living. Right Mindfulness (Sati) is to be consistently aware and attentive to the unfolding present. The Four Establishments of Mindfulness (found in the Satipatthana Sutta) refer to the ever present awareness of the activities of the body (kaya), sensations or emotional feelings (vedana), the cognitive activities, or thoughts, of the mind (citta), and of mental formations, or the ideas and conceptualizations of things (dhamma). Right Concentration is an state of focused attention or absorbtion. When meditation is done consistently and with correct conceptration, one is left with pure awareness of and a state of equinimity.